By Keith Cowing on April 30, 2008 11:05 PM. "Keith Cowing 30 April 2008 10:20 pm EST: I just got a phone call from Scott Parazynski at Everest Base Camp. He reports that he and his team feel great and that they returned to Everest Base Camp yesterday from Camp II after a 4 day stay. This was their second rotation up to Camp II which is also known as Advanced Base Camp. Camp II is located at 6,065 meters (19,900 feet)." "Yesterday we started the trek to Mt. Everest. We took a small prop plane from Kathmandu to Lukla. It was a short forty minute flight. The landing was very interesting, as the runway was built into a mountain. There was a cliff on one side and a rock wall on the other." By Keith Cowing on April 30, 2008 8:53 PM. Reader note: "Dear NASA Watch, I thought some of the NASA Watch readers might be interested in the YouTube video(s) from a recent lecture by Jack Schmitt, head of the NASA Advisory Council. Jack spoke to a full house at an IMAX theater in Houston, fielded 40 minutes of questions, gave a lecture entitled "Return to the Moon: What it was like and what it will be like", and then fielded another 25 minutes of questions. Jack also signed copies of his book for 2.5 hours after the lecture events. I'd be glad to have half his stamina when I'm that age!" By Keith Cowing on April 30, 2008 7:10 PM. "NASA did not establish the Orion SRB in accordance with Federal law or NASA guidance. The Orion SRB meets the Federal Advisory Committee Act (FACA) definition of an advisory committee. Although FACA committees must be established in accordance with FACA and NASA Policy Directive (NPD) 1150.11, "Federal Advisory Committee Act Committees," September 22, 2004, the Orion SRB was not." Editor's note: According to NASA PAO the Orion SRB membership consists of: Ed Gibson (chair) SAIC, Chester Sasaki, JPL, Richard Greathouse, NASA, Robert Bechtel, consultant, Ken Bowersox, consultant, Warren Brasher, consultant, Jack Garman, LM/Larc, Rick Green, JPL, Dave Hamilton, NASA, Neil Hutchinson, SAIC, Jim Jaax, consultant, Gary Johnson, consultant, Bob Kichak, NASA, Dave Kuntz, Sandia, Jack Lee, consultant, Al Louviere, SAIC, Charlie Mars, consultant, John Niehoff, SAIC, and Guru Shing, JPL. "An expert on government ethics said the conflict was "a flagrant abuse and Congress should investigate." "Not only is NASA ready to challenge the laws of physics, it appears more than willing to challenge the laws of Congress," said New York University professor Paul Light." By Keith Cowing on April 30, 2008 4:52 PM. "In the Senate, Kay Bailey Hutchison, R-Texas, a member of the powerful Appropriations Committee, said she was asking colleagues to add at least $1 billion to the NASA budget. Hutchison said she wants to add one more shuttle flight in order to ferry the $1.5 billion Alpha Magnetic Spectrometer to the international space station to study the energy-producing possibilities of cosmic rays. "We're not giving NASA the priority it should have," said Hutchison, a member of the Senate Republican leadership. "It should remain the premier agency for innovation and research." By Keith Cowing on April 30, 2008 11:39 AM. "In addition to the immediate, beneficial stimulatory impacts of increasing NASA's budget, the critically needed supplemental funding will revitalize long-term investments in our Nation's future. Unless Congress takes significant steps today to ensure NASA's success across all of its vital missions by providing appropriate funding for its broad array of responsibilities, we may very well relinquish America's future leadership in civil and military aviation, Earth and Space Science, and Aerospace technology, leaving our children to look eastward as the European Union and China move quickly to capitalize on our complacency." By Keith Cowing on April 30, 2008 10:13 AM. Editor's note: When employees take dramatic actions such as this - i.e. to circumvent traditional management chains to raise both personal - and important workforce issues - it is symptomatic of managerial insensitivity and incompetence at the top. Dave King should be taking this very seriously - as a personal failure in his own management of MSFC - not something an employee did that requires a reprimand. Reader note: This is an email that was sent by a Marshall employee yesterday.It was sent as a mass email (Marshall-wide global).Management response: "A MSFC employee sent a mass e-mail to the Marshall workforce today. We are taking appropriate action to provide assistance and to maintain a safe work environment for all of our employees. Due to Privacy Act considerations, we cannot comment further. Dave King, Director". Continue reading Things Are Getting Weird at MSFC: Absentee Management at the Top. By Keith Cowing on April 30, 2008 9:30 AM. Editor's note: You may see a new look and feel for NASA Watch appearing - and then disappearing. That's NASA Watch 3.0. We hope to have it online in the next few days or so. We're fiddling with things right now - so please excuse the mess. Once everything is working, we'll be featuring guest bloggers, a moderated comment feature, tagging capability for sites such as Digg, and a number of social networking and Web 2.0 features that further integrate our SpaceRef.com news, OnOrbit.com networking, and search capabilities. It is rather amazing to see what can be done these days - considering that I started NASA Watch on a Mac Classic II webserver on an ISDN line in our condo in 1996 - and was coding HTML by hand. I was blogging before the word had even been coined. Oh well. I am certain NASA Watch 4.0 will be under development soon enough. Stay tuned. Changes in Thinking at NASA, PBS Newshour, 29 November 1996. Scroll down a bit. Back then this website was called "NASA RIF Watch". "Keith Cowing follows all of this in cyberspace. He's a former NASA engineer who set up an Internet site that functions as a kind of super water cooler for all of NASA's far-flung employees. He calls it "RIF Watch." It features rumors, editorial comment, jokes, cartoons. It also frequently publishes high-level internal memos that NASA employees send to Cowing. He says there are a lot of unhappy people out there in NASA Land." Dammit Jim, I am a biologist, not an engineer. By Keith Cowing on April 30, 2008 9:06 AM. "The NASA budget -- people may complain about it, but it's still grown. It's still a very substantial fraction of everything else. The administration's been trying to repair the imbalance between life science and physical science, which is a problem." Editor's note: That's hilarious - given that the current problem with life sciences was actually caused by by the Bush Administration in the first place. Didn't they brief Marburger on this? By Keith Cowing on April 30, 2008 12:16 AM. "We have strong objections to both proposed alternatives. The Mosquito Lagoon and Merritt Island National Wildlife Refuge areas are premier destinations in Florida's six billion dollar saltwater recreational fishery. Florida's recreational fishery is one of the major economic engines driving Florida's tourist economy," said Ted Forsgren, CCA Florida Executive Director." Reader note: "In reference to "Rockets vs Fish", this is not without precedence. JAXA deals with this very issue. Their launch facility at Tanegashima has to work around the schedule for seasonal fishing, which is a primary industry of Japan. This can and does affect launch schedules from their facility. I can certainly respect the desires of local fishermen to keep their areas pristine, but ultimately both sides have to work together to do what's best for commercialization of space, providing recreational services to the public, and maintaining the economic benefits of the region." By Keith Cowing on April 30, 2008 12:05 AM. By Keith Cowing on April 30, 2008 12:00 AM. "Having discovered that millions of Bangladeshis could be poisoned through arsenic in their drinking water, a non-profit foundation launched a prize for the man who could prevent the crisis. The prize was won by a Bengali chemist who has not only cleaned up the water, but also gave all of his million-dollar prize money away." "Upcoming School Contacts: The National Air and Space Museum (NASM) in Washington, D.C. has been approved for an Amateur Radio on the International Space Station (ARISS) contact on Saturday, May 3 at 15:52 UTC via the telebridge station NN1SS in Greenbelt. This year Space Day will celebrate the 50th anniversary of NASA and NASA's achievements through space exploration. Youth, ages 12 -18, will participate." "Robert M. Nelson, a Senior Research Scientist at JPL and the lead plaintiff in the JPL case said, "Our attorneys remind us that the judicial system involves a very deliberate process. We will remain patient and let the judicial activity run its course. While we are waiting, NASA and Caltech are forbidden, under the existing temporary injunction, from conducting the intrusive personal background investigations ordered under HSPD#12."" By Keith Cowing on April 29, 2008 9:48 PM. "The iShoe won't help senior citizens walk on the moon, but its NASA technology will help rehabilitate the wearer's ability to balance. The insole was originally developed for NASA to enable astronauts to balance in outer space, where it has been tested extensively by astronauts aboard the space shuttle and Mir space station. For $10, the piece of NASA technology is a steal. Especially since it not only helps to reduce falls, but automatically notifies caregivers by phone if a fall were to occur." By Keith Cowing on April 29, 2008 9:42 PM. "Local universities, lead by UC Santa Cruz, have begun formally discussing the creation of a major new campus at Moffett Field intended to conduct research on space travel. UCSC, Santa Clara University, the Foothill-De Anza College District and Carnegie Melon University have all signed a letter of intent with NASA Ames, with all of them seeking a major presence in the NASA Research Park planned for Moffett." By Keith Cowing on April 29, 2008 3:11 PM. New Scientist Video: "A robot developed by roboticists at the University of Pennsylvania is made of modules that can recognise each other." Continue reading Today's Video: Robots That Crash Land and Then Fix Themselves. By Keith Cowing on April 29, 2008 12:23 PM. "Korea's first astronaut has been hospitalized due to severe back pains caused by a rough return voyage, the Korea Aerospace Research Institute (KARI) said Tuesday." "South Korea's first astronaut Yi So-Yeon returned home Monday, saying she still feels some pain following her unorthodox re-entry to the Earth's atmosphere." By Keith Cowing on April 29, 2008 11:58 AM. "We write to urge you to include $2 billion in funding for NASA in either a second economic stimulus package or the supplemental appropriations bill. Investing these much-needed resources in NASA will reimburse the agency for funds spent on return - to - flight expenses following the Columbia disaster and for repairs needed following Hurricanes Rita and Katrina. In addition, these funds will help close the gap between the Shuttle and Constellation programs to minimize our dependence on Russia. We believe these funds will provide an immediate and long-term economic stimulus for our nation's economy as well through additional investments in science and aeronautics R&D." Editor's note: Looking at who signed this letter, one reader asks: "Where's the Florida House delegation?" It would seem that Sen. Nelson has a little more arm twisting to do. By Keith Cowing on April 29, 2008 9:39 AM. "Nelson said that Floridians need to press their case on the presidential candidates, Republican John McCain and Democrats Hillary Clinton and Barack Obama. Clinton was the first candidate to outline support for "robust human spaceflight" and is seen as NASA's biggest booster of the three. But there are questions on how committed she is to the Bush administration's plans for exploration to the moon and then Mars." By Keith Cowing on April 28, 2008 3:15 PM. "In its thirteenth flight conducted from Satish Dhawan Space Centre (SDSC) SHAR, Sriharikota, today (April 28, 2008), ISRO's Polar Satellite Launch Vehicle, PSLV-C9, successfully launched the 690 kg Indian remote sensing satellite CARTOSAT-2A, the 83 kg Indian Mini Satellite (IMS-1) and eight nanosatellites for international customers into a 637 km polar Sun Synchronous Orbit (SSO). PSLV-C9 in its 'core alone' configuration launched ten satellites with a total weight of about 820 kg." "India will be in a position to carry out a manned space mission within seven years from now, said a top official of the Indian space agency here Monday." By Keith Cowing on April 28, 2008 2:50 PM. "Even if we were to increase the international budget 20 times to make a serious effort to go into space, it would only be a small fraction of world GDP. There will be those who argue that it would be better to spend our money solving the problems of this planet, like climate change and pollution, rather than wasting it on a possibly fruitless search for a new planet. I am not denying the importance of fighting climate change and global warming, but we can do that and still spare a quarter of a percent of world GDP for space. Isn't our future worth a quarter of percent?" By Keith Cowing on April 28, 2008 12:10 PM. "The Nepalese authorities have imposed a complete communication ban on journalists from the base camp upwards." "We knew there were restrictions on satellite phones and video cameras but were now told that even pre-recorded radio material on non-political subjects would not be allowed. Nor would informal chats with the hundreds of mountaineers currently in the camp, the tourism ministry official, Prabodh Dhakal, said. If any mountaineer talked to the BBC, he or she would be expelled, he added." Editor's 28 April note: Of course, I saw this coming too - it was inevitable. Editor's 22 April note: To clarify a bit on my Everest trip since many of you have asked: less than 2 weeks from departure, after I had paid, my 25 day stay at Everest Base Camp was suddenly cut by the climbing guide company to 10 days (with no explanation) while the cost of getting there was more or less identical. I was given no basic information as to what electronic items I could/could not bring with me. I cancelled my trip with great reluctance (an understatement) due to lack of confidence in what I could expect once I arrived. Continue reading Changing Travel Plans. By Keith Cowing on April 28, 2008 11:35 AM. "Caterpillar and NASA - the National Aeronautics and Space Administration - are getting closer to having the right earthmoving - er, moonmoving - equipment available to put on the moon in less than a decade to build habitats, roads and other infrastructure that could sustain life on the lunar surface. "We're pretty far along. I would say our partnership with Caterpillar is right on schedule," said Lucien Junkin, NASA's chief engineer of the Chariot project the two have been working on since 2006." 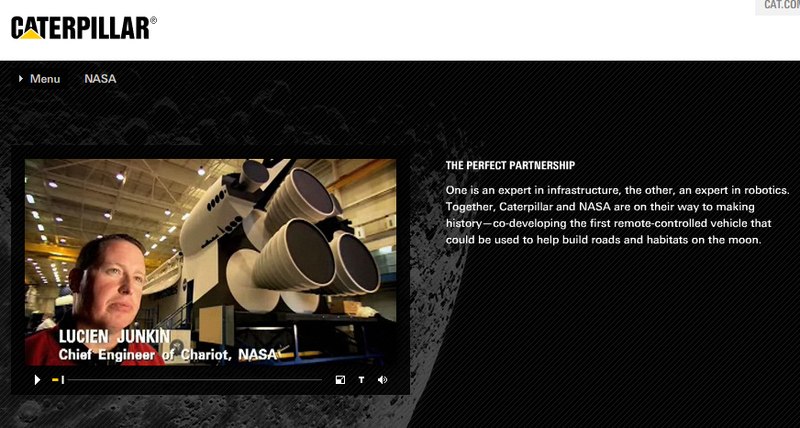 Editor's note: This is all very cool, but I can't seem to find the agreement or solicitation whereby this "partnership" between NASA and Caterpillar was put in place. Of course, it is certainly quite logicial for NASA to work with companies who already engage in many of the activities that will be performed on the moon. I am wondering why NASA has not made more public mention of this agreement and the interesting work it facilitates. Editor's update: I have now learned that this partnership is the result of one of the NASA Innovative Partnership Programs (IPP) FY 07 Seed Fund awards. By Keith Cowing on April 28, 2008 11:01 AM. Editor's note: In March NASA Watch reported that Ellen Engelman Conners had been selected as the new Director of External Relations at JSC replacing Eileen Halwey. Conners is a consumate Bush loyalist and overt politico. Well, nothing seems to have happened since then. She does not appear in the JSC X.500 directory and she does not seem to be on the job. She is also still listed as Senior Deputy Bureau Chief at the FCC in Washington, DC. Maybe someone changed their mind. By Keith Cowing on April 28, 2008 12:08 AM. "On Friday April 25, 2008 the Ninth Circuit Court of Appeals declined to review its earlier decision issuing a temporary injunction preventing NASA and the California Institute of Technology from conducting intrusive personal background investigations of employees at the Jet Propulsion Laboratory in Pasadena. The government had petitioned all of the judges of the Ninth Circuit Court for a review of a January 11, 2008 ruling by a three-judge panel of the Ninth Circuit that issued a temporary injunction stopping the investigations until a full trial is held in federal district court." By Keith Cowing on April 28, 2008 12:00 AM. Editor's note: The 10 meter sailing vessel Berrimilla completed a circumnavigation of the world via Cape Horn and the Cape of Good Hope, (http://www.berrimilla.com) during which her crew, Alex Whitworth and Pete Crozier, linked up with the crew of the International Space Station. As a result of this contact, Alex and Pete were invited by Leroy Chiao, who was the Commander of the ISS during their contacts, and Keith Cowing to give a presentation about Berrimilla's voyage to a Risk and Exploration Symposium at Louisiana State University (co-chaired by Leroy and Keith), using the voyage as a simple analog for a journey into deep space. After the Symposium, in a bar on the edge of LSU Campus, Pascal Lee drew a map in Alex's notebook. This became an invitation to undertake another, rather more symbolic voyage through the North West Passage to link up with the Haughton-Mars Project on Devon Island in time to observe the total solar eclipse on 1 August 2008. Editor's update: Leroy and I are a bit concerned about our friend Alex. Read the following words and imagine, instead of worrying about reaching Dutch Harbor, Alaska, that he is talking about Mars and the problems he and his crew mates are having getting back to base in a dust storm with a broken rover. Talk of remaining electrical power evokes Apollo 13 issues. All previous updates are online here. "We have a smidge over 4000 miles to Dutch. The next 700 or so of that is potentially windless. We may or may not have an engine. We have about 300 litres of diesel and 5 litres of oil. We need about 3.5 amps to run the computer and instruments. The airgen can carry that - mostly - when we have wind. So - lets say 40 days to Dutch. We desperately need wind - to motor 700 miles would use all our diesel but we can work the little breeze there is and squeak along. Yesterday we did 60 miles - so perhaps 11 - 12 days to the trades. Seems to me that the best bet is to monitor the engine very carefully and use it as necessary to get through the holes and up to 5 deg N and - I hope - some real wind. We need to keep about 80 - 100 litres of diesel for the N pacific, so we have perhaps 200 litres or 100+ hours of motoring @ about 4 knots = about 400 miles of the 700. Really skinny but manageable as long as the engine lasts. If the engine really has the dickies, then it's a long sail with very limited comms and whatever the airgen will give us to run the systems. Water will definitely be a problem." Send a message to the crew of Berrimilla - post in their "Gustbook"
By Keith Cowing on April 27, 2008 2:05 PM. "The organisation Students for the Exploration and Development of Space (SEDS) is seeking interns to work on a variety of interesting topics. You will be based close to Madrid, Spain. If you are interested to help out from your home via the Internet, that is possible and appreciated too!" What Will Future NASA Astronauts be "Flying"? By Keith Cowing on April 27, 2008 12:26 PM. "For what may be the first time since the inception of the American space program, the Navy is restricting nominations to the astronaut corps. The move comes nearly 50 years after Alan B. Shepard, a naval aviator, became the first American in space. The cutback, Navy officials say, comes as the service tries to retain the expertise it needs to fulfill its wartime obligations while experiencing an overall decline in its numbers." Editor's note: This is, of course, rather shortsighted from a national space exploration perspective - to say nothing of walking away from a proud naval aviator/astronaut tradition. Yet the Navy is using these pilots for what they are trained for - now. With the large number of astronauts already on the NASA payroll, the dwindling number of seats aboard shuttle missions, and the delay of the first Orion launches into 2016 (at the earliest) - spacecraft which are not "flown" like a shuttle, and the earliest lunar landings in the post-2020 period, why is it that NASA is going to be needing to recruit large numbers of new "aviator" astronauts in the first place? By Keith Cowing on April 26, 2008 5:32 PM. "What do the candidates say? John McCain speaks favorably for continuing the current course for space exploration, but he also wants to control spending, and that could further disrupt funding. Hillary Clinton has ambitious plans including quote: "Robust human space flight." Her emphasis appears to be on astronauts looking back, studying our own planet to combat global warming. And Barack Obama has suggested that while work in space is important and should continue, it's no longer inspirational, and NASA needs to reconsider its goals. Unlike President John Kennedy who launched the moon missions, not one of them is saying much about returning to the moon, and they rarely mention Mars." By Keith Cowing on April 26, 2008 2:58 PM. "Under the terms of a cooperative research and development agreement, only the third in NASA's history, NASA Ames and m2mi will work together to develop very small satellites, called nanosats, for the commercialization of space." "As you can guess, hardwired computer systems are much faster than general-purpose ones because they are designed to do a single task. But when they fail, they need to be totally reconfigured. This can be just a costly problem in a lab on Earth, but it can be vital in space. This is why a University of Arizona (UA) team is working with NASA to design self-healing computer systems for spacecraft." By Keith Cowing on April 26, 2008 10:26 AM. "... on Wednesday I received an e-mail from SFC William H. Ruth of the U.S. Army 101st Airborne Division stationed somewhere in Afghanistan. Sgt. Ruth wrote in response to SPACE.com Senior Editor Tariq Maliks story Monday about Prof. Stephen Hawkings belief in extraterrestrial life and he has a suggestion for NASA"
By Keith Cowing on April 25, 2008 8:19 PM. "Hodson, whose resum did not list any formal flight training or an academic background in engineering, mathematics, biological science, or physics, said he was positive that before the next launch, NASA officials would notice he had refilled all the staplers. And although Hodson falls below the specific standards of the NASA space physical for vision and blood pressure, as well as not meeting fitness, stamina, and strength prerequisites, the 20-year-old did meet the height requirement." By Keith Cowing on April 25, 2008 4:13 PM. Summarizes a November 2007 workshop that explored future directions of the U.S. civil space program. Prioritizes resources, especially those related to climate research, that were lost or placed at risk following recent changes to NPOESS and the GOES-R series of polar and geostationary environmental monitoring satellites, and presents strategies to recover these capabilities. Assesses potential space and earth science mission concepts that could take advantage of the capabilities of the Constellation system of launch vehicles and spacecraft being developed by NASA. By Keith Cowing on April 25, 2008 3:08 PM. "In a release issued by her Senate office, Clinton highlighted that Cornell University is a New York institution. She stressed the "historic relationship" between that state and Puerto Rico. "Cornell University scientists have used the remarkable tools available at Arecibo Observatory to greatly expand our understanding of the universe," Clinton said in the release. "I am proud to support the path-blazing accomplishments of these New Yorkers." By Keith Cowing on April 25, 2008 2:14 PM. "Although NASA talks about providing research opportunities on the ISS, we cannot forget that the funding cuts NASA has made to its microgravity research programs in recent years--whether willingly or not--have largely decimated that research community," stated Udall. "I think the onus has to be on NASA to prove that it means what it says by taking meaningful steps both to make the ISS a productive venue for research and to start to rebuild that research community. Yet, it won't be possible to have a productive ISS unless the facility can be sustained after the Shuttle is retired." By Keith Cowing on April 25, 2008 12:47 PM. "A 10-minute suborbital flight into space seems so last season. Now, for a cool $100 million (Dh367m) you can go to the moon. Space Adventures is offering a two-week vacation to stay at the International Space Station (ISS) and in the future, even a six-day extension for a trip around the moon should you fancy." By Keith Cowing on April 25, 2008 12:03 PM. "CLEVELAND - NASA's Glenn Research Center has experienced a water main break, and for the safety of all employees, the center has been closed for the remainder of the day. In addition, Glenn's Visitor Center will be closed today and through the weekend." By Keith Cowing on April 25, 2008 10:25 AM. - Any individual employee personnel action which may or may not be in work is not subject to discussion and therefore we cannot comment on any specific allegation other than to reiterate that no actions associated with procurement irregularities are currently or anticipated to be in work. - As far as any allegations of procurement irregularities regarding this matter, those allegations are false. There are no known procurement irregularity issues relative to Ares. A number of contract awards have been made over the last year regarding the Ares project and we are aware of no irregularities or concerns involving those contracts." Continue reading Curious Ares Staff Changes at MSFC. By Keith Cowing on April 25, 2008 9:46 AM. "The International Federation of Professional and Technical Engineers' (IFPTE), an AFL-CIO affiliated labor union whose public, private and federal sector membership includes engineers, scientists and technicians at the Department of Defense (DoD), the Department of Energy (DOE), NASA and Boeing, has given their backing to Senator Barack Obama for President of the United States. The IFPTE Executive Council voted without opposition late yesterday to endorse the Illinois Senator." Obama's response: " ... I'll fight for organized labor by protecting the right to organize. I'll support vigorous reinvestment in our federal research and development agencies, including NASA, to maintain America's leadership in Science and Technology and to foster economic competitiveness." By Keith Cowing on April 25, 2008 8:48 AM. "It seems that the educational MMORPG NASA's proposing will no longer have a budget of $3 million. Instead, any prospective development partner is being asked to create and maintain the MMORPG for free under a 'non-reimbursable Space Act Agreement'. It won't be a one-sided agreement, though. From NASA's RFP: 'In exchange for a collaborator's investment to create and manage a NASA-based MMO game for fun and to enhance STEM [science, technology, engineering and mathematics], NASA will consider negotiating brand placement, limited exclusivity and other opportunities." "When several prominent sources reported that NASA had lost funding for its upcoming educational MMO yet continued to seek game developers willing to work for free, we became curious. Why would NASA shoot themselves in the foot, yet continue to hobble along as if it never happened? But we soon found out the entire story lacked merit." Continue reading NASA MMO Role Playing Game Update. By Keith Cowing on April 23, 2008 2:31 PM. "To those of us who have committed our lives to the proposition that the exploration and development of space as the means by which we can build a prosperous global civilization that will last far beyond our current limits to growth, recent events have a familiar and depressing feel. There is a principle in the entrepreneurial world that if you present a business plan to an investor that does not meet their criterion for funding, you dont get funded. The same principle applies to government spending with the congress, executive branch and the people fulfilling the role of the investor." By Keith Cowing on April 23, 2008 11:05 AM. "As the legend goes, when the Spanish conquistador Hernando Cortez landed in what is now Mexico in 1519, he ordered the boats that brought him and his men there to be burned. Obama seems to have something similar planned for NASA." By Keith Cowing on April 23, 2008 9:10 AM. "Sierra County voters on Tuesday turned out in record numbers to give Spaceport America officials the funding and the taxation district the state needs to build the facility. With all precincts reporting, 65 percent of voters approved of the 1/4 of 1 percent gross receipts tax increase." By Keith Cowing on April 22, 2008 8:26 PM. Editor's note: According to NASA HQ Public Affairs: "this is an audio file of Peggy Whitson's interview with NASA Public Affairs Officer Rob Navias recorded soon after her landing aboard the Soyuz on Saturday. During the interview, Whitson states that some rescuers were there because of a fire. For clarification, the Soyuz capsule landed near an area where Kazak farmers were burning grass off the steppes. The fire was not related to the Soyuz landing." Despite multiple questions from the media as to what was reported by the crew and others about the Soyuz reentry, no mention was made by NASA personnel of this JSC PAO interview during a media telecon earlier today. Subsequently, NASA HQ PAO promptly released the original JSC audio after multiple media requests were submitted for this audio. "Saturday's bone-jarring landing happened after the capsule went into an unplanned ballistic re-entry. The Russians thought they had solved the descent problem after it cropped up last October and NASA agreed with their original analysis that a frayed wire was to blame, Gerstenmaier said." By Keith Cowing on April 22, 2008 4:45 PM. "NASA has awarded Space Exploration Technologies, or SpaceX, a NASA Launch Services contract for the Falcon 1 and Falcon 9 launch vehicles. The NASA Launch Services contracts are multiple awards to multiple launch service providers. Twice per year, there is an opportunity for existing and emerging domestic launch service providers to submit proposals if their vehicles meet the minimum contract requirements." Just How Dangerous Was That Soyuz Reentry? By Keith Cowing on April 22, 2008 3:21 PM. "Gerstenmaier was rather reluctant to get into any specifics preferring instead to defer, and to "let the Russians get the spacecraft back, dump the data from its computers, and allow the commission that has been established to look at what happened". He would repeat this caveat more than a dozen times during the press teleconference." Continue reading Just How Dangerous Was That Soyuz Reentry?. Is Sen. Domenici Preparing Legacy Pork For The Folks Back Home? By Keith Cowing on April 22, 2008 12:08 PM. Editor's note: Word has it that a $400 million earmark for a climate research center is being prepared on behalf of Sen. Pete Domenici (R-NM) who is retiring. Think of this as legacy pork. This climate change research center would not run be run by NASA or NOAA or EPA. Nor will there be any competitive bidding. Instead it would be run through the National Nuclear Security Administration (NNSA) which runs Los Alamos National Laboratory located in Domenici's home state of New Mexico. With all the arm waving and complaints about NASA not doing enough on the issue of climate change you'd think that this effort would go to NASA or if not NASA, then to NOAA. That is, if climate change research was really the prime overarching intent of this proposed allocation. One mechanism whereby this pork might begin to work its way into the funding que is via the Supplemental Intelligence Authorization Bill which is due for mark-up this week. If this does not work then other approaches are under consideration. Scott O'Malia, a minority staffer on the Senate Appropriations Committee is reportedly taking the lead on pushing this legacy pork through. Sen. Domenici serves as Ranking Member of the Senate Energy and Natural Resources Committee. Sen. Jeff Bingaman (D-NM) is chairman of that committee. Domenici is also Ranking Member of the Energy and Water Development Appropriations Subcommittee. Talk about a one-two punch. Apparently other members of the Senate and key House appropriators only learned of this activity in the past few days. The National Nuclear Security Administration and the Supplemental Intelligence Authorization Bill are such logical places to put climate change funding, right? By Keith Cowing on April 22, 2008 8:04 AM. "There are plans to manufacture four Soyuz spacecraft in 2009 to launch crews to the ISS," [Vitaly Lopota, the president of the Energia space rocket corporation] said. If the Russian space program was financed in full, Russia would not need to make money on space tourism, Krasnov said. "If we lack money, we will have to launch space tourists," he said." "Russia could soon follow the Middle Eastern sovereign wealth funds and invest billions of dollars in direct overseas investments if, as expected, its national welfare fund is given more freedom to invest." Editor's note: Interesting how the govenrment-owned Energia is now using a quasi-state controlled news outlet to lobby for increased government funding for Russia's space program. One upon a time Russia's space program was so broke the only way to could continue was with outside financial help - from the U.S. and selling seats on Soyuz flights. Now, I guess, those Russian petro-Rubles are easier to find. Too bad. In retrospect, the commercial space traveler program has given the ISS a more cosmopolitan face since its inception and has injected some actual commercialism into the otherwise (multi) government-controlled ISS. By Keith Cowing on April 21, 2008 8:25 PM. "Stephen Hawking called for a massive investment in establishing colonies on the Moon and Mars in a lecture in honour of NASA's 50th anniversary. He argued that the world should devote about 10 times as much as NASA's current budget - or 0.25% of the world's financial resources - to space." By Keith Cowing on April 21, 2008 12:54 PM. Astute reader observation: "Well, Keith, at least now when I see a rerun of the old Space: 1999 TV show, I'll know that more than 24E18 GJ of energy was required to send Moonbase Alpha off into deep space! LOL You have many talented readers." "Impact" chronicles the aftermath of a meteor shower during which a piece of a dwarf star lodges itself in the moon. That triggers a series of anomalies on Earth, including cell phone service interruption, exaggerated tides and the occurrence of sporadic weightlessness. Astrophysicist Alex Kinter (Elliott), with a help of a female astronomer, discover that the moon has been dislodged from its orbit and is on a collision course with Earth." reader math note: "For what its worth ..... Just a quick note on your stupid movie alert: The minimum delta-V required to put the moon on a collision course with earth is about 4 km/sec. Assuming a lunar mass of 7.348300E+22 kg the kinetic energy equivalent is about 6x 10^14 giga joules. This equates to roughly 1.42 million 100-megaton Fusion warheads exploding simultaneously - and they won't have long to wait for collision .. about 4 1/2 days." Another reader math note: Noticed that the kinetic energy calculations needed to cause a moon-Eartn collision were a bit off. If a delta V change of 4km/sec is needed then the kinetic energy required is 6 x 10^17 trillion Joules (1/2*m*v^2). The number of 100 Megaton weapons required to release this energy is 1.24 trillion. And yet another reader math note: "For what it's worth I think the first calc is right 1/2mv^2 = 8*7.34E22 joules = 6E23 joules = 6E14 Gjoules ... no? Don't know how many nukes that is but "a lot" would be a reasonable number ..."
And yet still another reader math note: WRT Stupid Movie Alert, some correct physics: Lunar mass is 73.5E21 kg; required deceleration impulse is--on average--809.3 m/s; kinetic energy exchange is thus 24E18 GJ, the equivalent of 57.5E6 100 MT bombs, "a lot." more reader math: Lunar mass is 73.5E21 kg; required deceleration impulse is--on average--809.3 m/s; kinetic energy exchange is thus 24E18 GJ, the equivalent of 57.5E9 100 MT bombs, "a lot more than before." By Keith Cowing on April 20, 2008 11:04 PM. "Virgin Galactic boss Sir Richard Branson is planning to set yet another record - by becoming the first man to marry a couple in space. The 58-year-old billionaire intends to conduct a ceremony 70 miles above the Earth on the first Galactic sub-orbital flight next year." Anatoly Perminov: Superstitious Throwback or Just Sexist? By Keith Cowing on April 20, 2008 6:36 PM. "Later, [Federal Space Agency chief Anatoly] Perminov was asked about the presence of two women on the Soyuz, and referred to a naval superstition that having women aboard a ship was bad luck. "You know in Russia, there are certain bad omens about this sort of thing, but thank God that everything worked out successfully," he said. "Of course in the future, we will work somehow to ensure that the number of women will not surpass" the number of men. Challenged by a reporter, Perminov responded: "This isn't discrimination. I'm just saying that when a majority (of the crew) is female, sometimes certain kinds of unsanctioned behaviour or something else occurs, that's what I'm talking about." Editor's note: In the U.S. such a comment about would result in an adverse job action - at a minimum. This is more than bad translation: Perminov stepped in this three times. One of the women mentioned is a NASA civil servant. Will NASA respond? We'll see. "Whitson surely could have done without the crash landing of the Soyuz capsule which because of a technical glitch dove through the atmosphere much steeper than planned, subjecting the crew to 10 times the force of Earths gravity -- nearly triple the usual force. But what was really unnecessary were the off-color comments of yet another Russian official regarding women in space. Whitson, you may remember, was given a going-away gift by her Russian hosts of a whip." By Keith Cowing on April 20, 2008 4:11 PM. Editor's note: There has been a disappointing development in how the NASA Advisory Council posts things on its website. Although they were not the fastest organization at NASA (often taking months simply to post documents that were already completed), they did eventually manage to post the presentations. Well, now it would seem, presentations made at these meetings (which are open to the public) can only be obtained by asking Paul Iademarco, the NAC Executive Director (see Feb 2008, Oct 2007 July 2007 etc.). So much for openness at NASA. Friday afternoon I asked Iademarco for a copy of a Gen Y perspectives presentation that was made at the NAC meeting yesterday. He told me by email "I will post the presentations when the minutes are completed. It usually takes about 3-4 weeks on average. However we always strive to get everything posted sooner." Oh yes, have a look at the minutes that have to be prepared - October 2007 for example. This short document takes 3-4 weeks to prepare? Moreover, it has been 11 weeks since the 7 Feb meeting and the minutes/recommendations for that meeting are not even posted yet. Gee, why bother - its all stale by now. Anyone attending this meeting could have gotten a hardcopy of the presentation or taken pictures of it on the screen. The Gen Y folks certainly have a valid point to make when they suggest that things could be done much more efficiently and effectively at NASA if only NASA personnel took the time to learn how to use the tools at hand - and if they truly wanted their part of the agency's activities to be responsive and transparent. Ironically it seems that the very place where NASA gets this sort of advice is one of the places most in need of applying this advice. By Keith Cowing on April 19, 2008 1:30 PM. "At a Russian news conference, Russian officials said the crew was in good health after a "controlled, ballistic decent. The crew feels great, all of them. ... The reasons for the ballistic descent will be investigated after the descent module will be delivered to the Energia Corporation." By Keith Cowing on April 19, 2008 12:10 PM. "19 April 2008 4:00 am EST. Update by Keith Cowing. I just got a satellite phone call from Scott Parazynski at Everest base Camp. He was expecting to leave a voice mail when I picked up the phone. We had a short chat during which he updated me on his stay. Scott and his team have been at Everest Base Camp at an elevation of 5,380meters (17,700ft) on the south side of Mt. Everest in Nepal for a week now." By Keith Cowing on April 19, 2008 1:22 AM. Editor's note: The 10 meter sailing vessel Berrimilla recently completed a circumnavigation of the world via Cape Horn and the Cape of Good Hope, (http://www.berrimilla.com ) during which her crew, Alex Whitworth and Peter Crozier, linked up with the crew of the International Space Station. A number of interesting physical, psychological and planning similarities were apparent. As a result of this contact, Alex and Peter were invited by Leroy Chiao, who was the Commander of the ISS during their contacts to give a presentation about Berrimilla's voyage to a Risk and Exploration Symposium at Louisiana State University (co-chaired by Leroy and Keith Cowing), using the voyage as a simple analogue for a journey into deep space. After the Symposium, in a bar on the edge of LSU Campus, Pascal Lee drew a map in Alex's notebook and, perhaps foolishly, signed it. This became an invitation to undertake another, rather more symbolic voyage through the North West Passage to link up with NASA's Haughton-Mars Project on Devon Island, which Pascal runs, in time to observe the total solar eclipse on August 1 2008. Listen up - Alex Right you lot - listen up and you can shout at me later. Some rather crudely potted philosophy - don't know whether I can get this into words that I like but it seems worth a go. I think I'm speaking for McQ here too, but she's asleep so can't ask her. Continue reading Inspired by a Conference to Explore. By Keith Cowing on April 18, 2008 12:49 PM. "Preparing to conduct science experiments while floating weightless in an airplane has been no easy task for the University of Maine and University of Southern Maine team chosen to participate this summer in NASA's Reduced Gravity Student Flight Opportunities Program. Now, the biggest challenge left to the 10-member team known as Dirigo, the first ever from Maine, is to raise the money necessary by late June to get them and their experiment off the ground." By Keith Cowing on April 18, 2008 5:31 AM. "Sierra County residents are being promised the stars if they support a spaceport tax, according to this morning's Albuquerque Journal. As election promises go, it's a little more grand than a chicken in every pot. In fact, it's out of this world, the Journal noted of Tuesday's get-out-the-vote meeting at the Hot Springs High School." "Opponents of a proposed quarter-cent tax to fund New Mexico's spaceport allege state Transportation Department workers took down their campaign signs. A woman who is organizing a Saturday protest against the tax, April Schmidlapp, said state workers ordered tax opponents to remove their signs along the town's main street." By Keith Cowing on April 18, 2008 1:22 AM. "Lockheed Martin Corporation is now using the spaceport to advance some of its less-publicized technology. This prototype of Lockheed Martin's new spacecraft is only one-fifth the size the future vehicle would be." Who's Worse For NASA: Democrats or Republicans? By Keith Cowing on April 17, 2008 3:58 PM. Editor's note: According to page 8 of the April 2008 Aviation Week ShowNews Briefing, AIA Space Systems VP J.P. Stevens says "It will be a battle if there is a Democratic administration". Let's look at this a little more closely. Yes, Sen. Obama (D-IL) has indeed talked of drastic and unwarranted cuts to Project Constellation - and has said rather negative things about human spaceflight. But that's about the only specificity we've heard from him. By stark contrast, Sen. Clinton (D-NY) seems to be outright supportive of NASA. Yet it is Sen. McCain (R-AZ) who has proposed a freeze on discretionary spending (which includes NASA's budget) which would amount to a cut (or non-growth) at a time when a number of NASA projects are depending upon budget increases. And this would be set against a backdrop whereby the Bush Administration won't lift a finger to prepare a budget for FY 2010 - leaving the incoming Administration to scramble to cobble one together between November 2008 and January 2009. This comes after the Bush administration walked away from the earlier financial commitments it had made for the implementation of the VSE. If anything, in 2008, with the politics in play - and the history of the past few years before us, the Republicans seem more intent upon depriving NASA of needed budget funds - and have a proven track record of doing so. Then again, only time will tell what will actually happen. By Keith Cowing on April 17, 2008 3:43 PM. "NASA will not ask Congress for permission to continue buying cargo space on Russian Progress resupply vehicles for the International Space Station (ISS) after 2011, opting instead for an all-commercial approach under its nascent Commercial Orbital Transportation Services (COTS) program. Administrator Michael Griffin has sent a letter to Capitol Hill specifically excluding Progress from a request to continue using Russian Soyuz capsules to deliver crew to the ISS after the shuttle retires in 2010. Griffin had no immediate comment, but William Gerstenmaier, associate administrator for space operations, said April 16 that NASA believes one of the commercial vehicles in development under the COTS program will be able to meet its ISS-supply needs." By Keith Cowing on April 17, 2008 10:56 AM. "On October 10-11, 2007, the committee held a general data-gathering meeting at which representatives from NASA headquarters briefed the members on the ETDP. The meeting was followed by site visits from subsets of the full committee to three NASA centers for detailed presentations on each of the 22 individual program projects. The results of the committee's study as of December 2007 are described in the present interim report. The committee's final report, described below, is planned for release in the summer of 2008." Why Are The Candidates Afraid To Talk About Science? By Keith Cowing on April 17, 2008 10:13 AM. "Tomorrow Hillary Clinton, Barack Obama and John McCain should have been going toe-to-toe in a televised science debate. All three were invited by a bipartisan group of Nobel laureates and other scholars called ScienceDebate 2008 to step on stage at the Franklin Institute in Philadelphia and explain how they will ensure that America continues to dominate the sciences. Leading in scientific research and advancement is an essential element to our future prosperity, health and national defense. All three candidates declined. Apparently the top contenders for our nation's highest elective office have better things to do than explain to the public their views on securing America's future." By Keith Cowing on April 17, 2008 12:00 AM. "Here are a few more pictures and words for you regarding the CSA/McGill University Satellite system here at the CSA camp at Expedition Fiord on Axel Heiberg. Note that some engineering support was provided by NASA Ames - NASA Research and Engineering Network (NREN) engineer Ray Gilstrap. You can see him assembling one of the point to point wireless repeater bases we used." By Keith Cowing on April 16, 2008 9:34 PM. "Despite [Lord Martin Rees] views, though, Europe is pursuing a vigorous human spaceflight policy and has so far spent 5bn euros ($8bn; 4bn) on the space station. Just last week, Esa unveiled a campaign to recruit the European astronauts of tomorrow. Britain has also hinted at a change in its long-standing opposition to human space activities following several high-profile reports. One, a specially convened government advisory panel, suggested the UK's policy has damaged the country both scientifically and economically." Editor's note: It would seem that Lord Martin is in a distinct minority in regard to his anti-human spaceflight stance. Besides, we all know what Dr. Who would say - and he is much more in tune with reality. By Keith Cowing on April 16, 2008 4:08 PM. "Nico Marquardt used telescopic findings from the Institute of Astrophysics in Potsdam (AIP) to calculate that there was a 1 in 450 chance that the Apophis asteroid will collide with Earth, the Potsdamer Neuerster Nachrichten reported. NASA had previously estimated the chances at only 1 in 45,000 but told its sister organisation, the European Space Agency (ESA), that the young whizzkid had got it right." Editor's note: Reliable sources report that this story is inaccurate - at best. Stay tuned. "Contrary to recent press reports, NASA offices involved in near-Earth object research were not contacted and have had no correspondence with a young German student, who claims the Apophis impact probability is far higher than the current estimate." Continue reading Stories That Are Too Cute to be True. By Keith Cowing on April 16, 2008 1:05 PM. "The Yankees today announced that NASA astronaut Garrett Reisman will throw out the ceremonial first pitch from the International Space Station prior to Wednesday's game vs. the Boston Red Sox. It will be the first ceremonial first pitch ever thrown from space in Yankee Stadium history." STS-73: "Crew took time out from Spacelab work to tape ceremonial first pitch for Game Five of baseball World Series, marking first time the thrower was not actually in the ballpark for the pitch." Image: "STS073-E-5135 (26 October 1995) --- Baseball caps from the two 1995 World Series representative franchises float near the cabin windows of the Earth-orbiting Space Shuttle Columbia, with the Earth in the background." Image: "STS073-E-5137 (26 October 1995) --- Baseballs from the American and National Leagues float near the cabin windows of the Earth-orbiting Space Shuttle Columbia, with Earth in the background." Continue reading This May Be A First For The Yankees But --. By Keith Cowing on April 16, 2008 12:05 AM. "New questions are surfacing about cancer cases at NASA Glenn Research Center and how long the problem may have existed. NewsChannel5's Autumn Ziemba spoke with NASA retirees and spouses of employees who died of cancer decades ago after working in the development engineering building. It's the same building where at least 40 people have been diagnosed with cancer, but now these people are wondering if there was a problem, how long did it exist?" "Patient confidentiality prevented the agency from demanding personal health information on cancer rates, said Thomas Hartline, director of safety at NASA Glenn. ''Therefore, we have not been able to verify the numbers that the union put out,'' he said." By Keith Cowing on April 15, 2008 10:54 PM. Continue reading Today's Video: Rick Searfoss Loses An Argument With an Old VW. By Keith Cowing on April 15, 2008 6:21 PM. "The plan is centered around a one-year freeze in discretionary spending -- with the exception of military and veterans programs -- to allow for a "top-to-bottom review of the effectiveness of federal programs." "'Discretionary spending' is a term people throw around a lot in Washington, while actual discretion is seldom exercised," McCain said. "Instead, every program comes with a built-in assumption that it should go on forever, and its budget increase forever. My administration will change that way of thinking." By Keith Cowing on April 15, 2008 2:28 PM. "A Texas congressman trying to keep his job could be the best hope for Kennedy Space Center workers trying to keep theirs. But it's a slim hope at best. Meet U.S. Rep. Nick Lampson, a Democrat defending a Houston-area seat once held by former Republican Majority Leader Tom DeLay. Like DeLay, Lampson is an avid NASA supporter with strong ties to nearby Johnson Space Center." By Keith Cowing on April 15, 2008 2:27 PM. "NASA plans to select the first four research sites towards the end of this year. Each one will be funded to the tune of $1 to $2 million annually, and together they will employ about 50 scientists. As NASA's lunar budget grows in the build-up to a human flight to the moon by 2020, the institute will grow to include more collaborating sites, including sites in other countries. "I would anticipate that within a few years we may have five or six nodes abroad," said Worden." By Keith Cowing on April 14, 2008 10:12 PM. "NASA had a hand in designing the LZR, and Speedo claims it makes swimmers go two per cent faster. "They say that the suit is rocket science, but the stats are not rocket science," Schubert said. "The proof is in the performance." "So there is a new swimsuit, designed with help from NASA and its wind tunnels, made of low-drag, lightweight, polyurethane fabric that repels water. This otherworldly apparel is causing quite a splash -- my goodness, did I just write that? -- in the underworld of swimming. The swimsuit, made by Speedo, is called the LZR Racer. The cost of this swimsuit is $550, or twice the amount of my annual clothing budget." "To reduce hydrodynamic drag, Aqualab began testing some 60 fabrics, with the help of a NASA wind tunnel, before coming up with a model made of extremely fine yarn that is densely woven together." FY 2010 Budget Limbo: Its Official! By Keith Cowing on April 14, 2008 11:01 AM. "The FY 2010 Budget will be submitted by the next President. In order to lay the groundwork for the incoming Administration, we intend to prepare a budget database that includes a complete current services baseline 1 and to gather information necessary to develop current services program estimates for FY 2010 from which the incoming Administration can develop its budget proposals. ... You are not required to submit a formal budget request in September, and there will be no formal Director's Review or Passback processes this Fall. Most of the policy materials you usually submit in September in support of your budget requests will not be required until after the new Administration or Transition Team is in place, although as noted above you may be asked to provide information on select topics in the Fall. Many non-policy materials will be required, however, as discussed below." By Keith Cowing on April 13, 2008 9:11 PM. "They aimed high, and they got burned," says Arizona State University's Phil Christensen, a Mars scientist who helped review NASA's Mars program. To make up for Mars Lab's ballooning cost, $1.2 billion, NASA has had to raid the coffers of other science projects. ... Despite the missteps, Edward Weiler, the acting head of NASA's science division, says he'll do what it takes to fund the rover. Many NASA science projects will have take a small hit to pay for the overruns. "I'm trying to spread the pain," Weiler says. "Everything is fair game." Editor's note: Ah, how quickly NASA slides back to the old way of doing things - one big project bursts through its cost cap and everyone else has to pay for it. Where is the incentive to stay within cost caps if you know that NASA will always pay your overrun and take it out of everyone else's hide - especially if you are a big center with lobbyists prowling around Congress? Indeed, doesn't this incentivize other projects to build in some margin in their proposals (thus increasing costs) as insurance ? Why "spread the pain", Ed? Why not focus the "pain" on the source of the overrun? By Keith Cowing on April 13, 2008 6:39 PM. "Q: Why is NASA hosting this event? Worden: Tonight, there are at least four NASA centers doing it. The fundamental issue facing NASA is that we're embarking on the most significant step that has ever been done in space. The next step is settling the solar system." By Keith Cowing on April 13, 2008 6:14 PM. "The photos here were taken yesterday (satellite receiver) and last week (aerial of the CSA camp). More when time permits. I have to go hit the road via snowmobile to get back to the McGill High Arctic Research Station (MARS) which is where we are staying. It is not far, but it is a bit cool right now -25C - which for this time of year is not too bad." Is Ellen Engelman Conners Coming to JSC? By Keith Cowing on April 13, 2008 6:08 PM. Editor's note: It has been a month since NASA Watch first reported that Ellen Engelman Conners had been selected as the new Director of External Relations at JSC. At the time sources were not exactly certain when the formal offer was going to be made and/or if she had indeed accepted it. By Keith Cowing on April 13, 2008 12:53 AM. "We spoke on the satphone to Leroy and Karen for Yuri's night. Interesting change of circumstances - when Pete and I first spoke to Leroy, he was up there hurtling around in his concatenation of tin cans and plumbers tubing and we were on a speaker phone in the Falklands, at Arlette Betts' house. This time, we were in the vee-hicle, by no means hurtling though, and Leroy and Karen were on the speaker phone." One small sip for humankind, one huge sip for Yuri. We thought a Consultation in his memory at lunchtime would be appropriate and it was. We have 3 versions of Dr Cooper's medicinal compound this time - one brewed by Pete, one by Steve and one by Jasper - and we think that with proper abstemiousness (abstention? or maybe that's just for the pollies)the supply will get us to Dutch. There is a small quantity of emergency rocket fuel as well, just in case." By Keith Cowing on April 12, 2008 3:12 PM. "Central Washington might not seem like a lunar landscape to some people, but NASA sees enough similarities with the moon that it plans to test a prototype of a lunar vehicle there this summer. NASA is preparing to send astronauts to the moon by 2020 to build a lunar outpost. As part of that preparation, it's testing a prototype of a 1 ton lunar truck called the Chariot. NASA expects to begin testing the vehicle near the Grant County ORV Park on June 2 or 3 and finish about two weeks later, said Lucien Junkin, a robotics engineer and the design lead with the Johnson Space Center." By Keith Cowing on April 12, 2008 11:47 AM. "Tyler Monroe, a senior at MCHS, hopes the next president will support the endeavors of NASA. "I think it's really important that we further the exploration in space," he said. "Space is the next frontier." "Q: What do you plan to do with the space agency? Like right now they're currently underfunded, they, at first they didn't know if they were going to be able to operate Spirit rover. What do plan to do with it? Continue reading Obama On Space Exploration (update). By Keith Cowing on April 12, 2008 11:19 AM. By Keith Cowing on April 12, 2008 12:00 AM. "When Yuri's Night, an organization dedicated to forwarding the cause of space exploration by holding events around the world each April 12, held over 120 parties on a single day in 2007, it was viewed as an incredible accomplishment unlikely to be topped. Earlier this week, though, Yuri's Night 2008 not only met that mark but completely left it in the dust, registering 173 events in 49 countries, with 3 days still left before the big event." Continue reading Let's Party Like It's 1961. By Keith Cowing on April 11, 2008 9:30 PM. "Plodding north - we're 30 miles NE of Crowdy Head and a smidge north of Lord Howe Island, so this is the furthest north I have ever been in Berri in the Pacific but I hope we can keep breaking that little stat. Just making 3 kts into the current - swell not so bad, lovely morning. Satphone rigged and seems to be working. Time for some coffee and a wad. I dont think today will be a hundred miler. Will now have to do complicated maths to work out what time it is in Texas and Louisiana for Yuri's night phone calls. Everything seems to be working so far...just a bit slow on the hoof"
By Keith Cowing on April 11, 2008 5:46 PM. "Perminov said Friday that Russia may stop selling seats on its spacecraft to "tourists" starting in 2010 because of the planned expansion of the international space station's crew. He said the station's permanent crew is expected to grow from the current three to six or even nine in 2010. That will mean that Russia will have fewer extra seats available for tourists on its Soyuz spacecraft, which are used to ferry crews to the station and back to Earth." By Keith Cowing on April 11, 2008 8:52 AM. "In short, the high visibility of returning to the moon offers an opportunity to build the kind of "soft-power" that serves America's long-term national interests. The reverse is also true. Having made the commitment, laid out a plan, and started to develop capabilities, changes in direction can only send a message of American inconstancy. Procrastination, especially for short-term budget considerations, can only undermine faith in American leadership and priority setting. Failure to execute can only send a message of incompetence." A Way To Limit Radiation Hazards In Space? By Keith Cowing on April 11, 2008 12:14 AM. "For astronauts, however, there is one danger in space that does not end when they step out of their spacecraft. The radiation that permeates space-- unattenuated by Earth's atmosphere and magnetosphere--may damage or kill cells within astronauts' bodies, resulting in cancer or other health consequences years after a mission ends." "An experimental drug helped protect mice and monkeys from the damaging effects of radiation, researchers said on Thursday, in a finding that may lead to less toxic cancer treatments or an emergency treatment for radiation exposure." "... Supported by grants CA75179 and AI066497 from NIH and grants from NASA (U.S. National Aeronuautics and Space Administration)"
By Keith Cowing on April 10, 2008 5:38 PM. "Michael R. Luther has been named deputy associate administrator for programs in NASA's Science Mission Directorate at NASA Headquarters in Washington. Ed Weiler, associate administrator for the directorate, made the announcement Wednesday." By Keith Cowing on April 10, 2008 5:12 PM. "On Fri., April 11 NASA's Glenn Research Center will host a media briefing to discuss the health concern allegations recently reported in the media. The briefing will begin at 4 p.m. in the Development Engineering Building. The building is located on the north side of Brookpark Road." By Keith Cowing on April 10, 2008 3:30 PM. "Yesterday, I had a very interesting and thought-provoking discussion about the future of JSC and how we're going to get there. (I'm trying to be careful about name-dropping, so as to keep the focus here on the ideas more so than personalities.) One of the subjects we broached was how JSC is famous for its mission operations work, but that a lot of the good engineering work we're doing here is going unnoticed by the public-at-large. I'll actually be meeting with someone tomorrow who is heading up the Engineering Directorate's efforts to share their innovations both internally and externally." By Keith Cowing on April 10, 2008 2:07 PM. "ATK, which is building the first stage of NASA's Ares I crew launch vehicle by recycling the solid-fuel booster it builds for the space shuttle, wants to make the same capability available to other users for missions without crews. Ron Dittemore, president of ATK Launch Systems, said the human-rating that led NASA to build the Ares I first stage around the shuttle booster should also be attractive to other customers with "high-value" payloads, including the Defense Dept. and the National Reconnaissance Office (NRO)." Reader note: Great news taxpayers! First NASA pours money into a problematic launch vehicle and then ATK gets to use the beneficiary of that public investment as a product to sell - for profit. What a concept! "Horowitz, now an independent aerospace consultant whose clients include ATK, the Ares I first-stage contractor, and a "greybeard" advisor to NASA through the NASA Engineering and Safety Center, served on the tiger team that reviewed the thrust oscillation issue after it arose last fall. Garry M. Lyles, the senior NASA engineer who headed that review panel, is scheduled to brief Congress on his findings the week of March 31." By Keith Cowing on April 10, 2008 10:26 AM. "Federal Industry Minister Jim Prentice confirmed Thursday morning that he has taken the unprecedented step of rejecting the planned $1.3-billion sale of Canada's leading space company to U.S. interests, concluding that the deal would not be in the best interests of the country. Mr. Prentice's office issued a brief statement acknowledging that, as The Globe and Mail reported, he wrote to Alliant Techsystems Inc. (ATK) on April 8, to advise them that, "based on the information received at this time, he is not satisfied that the proposed sale of MacDonald, Dettwiler and Associates Ltd. (MDA) to ATK is likely to be of net benefit to Canada." "... And while there are jobs at stake, perhaps this case has shown the government that investing in space is important to Canada's interests and that they should try to revive an industry that has been neglected for some time." "With all the discussion about the sale of MDA's space division to ATK I thought it might be useful to provide some background documents that explain what Radarsat-2 is and it's impact. Of note, the Canadian Space Agency Departmental Performance Review for 2007 lists the total expected cost of Radarsat-2 to be $421.6 million." By Keith Cowing on April 9, 2008 6:34 PM. "SPACEHAB, Incorporated (NASDAQ:SPAB), a provider of commercial space services, today announced that the Company's common stock has closed for more than 30 consecutive days below the minimum $1.00 per share requirement for continued inclusion on the Nasdaq Capital Market under Marketplace Rule 4310(c)(4)." By Keith Cowing on April 9, 2008 4:54 PM. 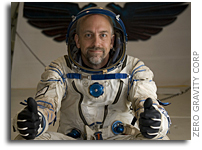 "Science Education invites students to use their creativity to design an original piece of art for a student mission patch for private space explorer, Richard Garriott. As the next civilian to fly to space, Richard plans to engage students around the world before, during and after his flight to the International Space Station planned for October 2008." "We strongly encourage students to participate as we take a new and creative approach with this webcast, by asking students to submit videos to be posted on the Challenger Center YouTube site." By Keith Cowing on April 9, 2008 3:07 PM. "And the iPods, all $800 bucks' worth, were purchased by a NASA supervisor who -- and I stress, this is true -- had his name engraved on each of them. Obviously there are more egregious cases in the GAO study, but these are the most fun ones." Continue reading NASA Spinoff: Data Storage Devices That Play Music. By Keith Cowing on April 9, 2008 1:08 PM. "The High Resolution Imaging Science Experiment, run from The University of Arizona, has produced a new color stereo view of Phobos, the larger and inner of Mars' two tiny moons. The HiRISE camera aboard NASA's Mars Reconnaissance Orbiter took two images of Phobos 10 minutes apart on March 23. Scientists combined the images for a stereo view. "Phobos is of great interest because it may be rich in water ice and carbon-rich materials," professor Alfred McEwen of the UA's Lunar and Planetary Laboratory, and HiRISE principal investigator, said." By Keith Cowing on April 9, 2008 12:55 PM. Reader note: I work in the DEB (Bldg 500 a.k.a Slaughterhouse 500). The 2nd floor is full of contractors like me who feel as if we have no voice or rights. Like any contractor, I want to remain anonymous for fear of losing my job. Continue reading More Contamination and Health Concerns at GRC. By Keith Cowing on April 9, 2008 10:23 AM. "The "Rocket Boys" story is really going to be rocking thanks to a group of directors and producers from New York and New Jersey, who decided to adapt local author Homer Hickam's best seller, "Rocket Boys" (made into the hit movie "October Sky") to the stage. The play is called "Rocket Boys, the Musical" and producers hope to eventually get it on Broadway. It's already received numerous awards, including being one of three to receive the Academy for New Musical Theatre's Search for New Musicals Award in Los Angeles and the ASCAP/Disney Musical Theatre Workshop in New York." By Keith Cowing on April 9, 2008 9:42 AM. "James Albaugh, Boeing president and chief executive, warned that the United States risks losing a leadership role in space if Congress and military leaders don't reinvest in new space technologies over the next decade. "We can't afford the so-called rebuilding years of our space capability," he said during an April 8 speech at the National Space Symposium, here. "The next decade must be about reaffirming our leadership role in space." By Keith Cowing on April 9, 2008 9:28 AM. "The USA's presidential election could leave NASA short of the funding it needs to keep its Orion crew exploration vehicle and Ares I booster project on track for their planned maiden flight in March 2015." Editor's note: This really has nothing directly to do with the election this year. Continuing resolutions happen in non-election years as well as election years - just last year as a matter of fact. Congress has also passed budgets in election years as well. "To make room for AMS in the orbiter's payload bay the ISS cargo rescheduling idea was to move equipment from the bay's interior into a Multi Purpose Logistics Module (MPLM), which is transported by Shuttle, or ESA's ATV." Editor's note: MPLMs are only carried to/from ISS by Space Shuttles. Portions of the ATV's cargo section structure are based on MPLM designs - but they are not MPLMs. By Keith Cowing on April 8, 2008 9:06 PM. "NASA Goddard officials have announced that an incident earlier this evening in a building at Goddard did not involve a chemical spill or release of any hazardous material. Managers believe that a malfunction in the high volume air conditioning system caused humidity to vent and a condensation cloud to form." Continue reading Chemical Spill Scare at GSFC Forces Evacuation. By Keith Cowing on April 8, 2008 6:09 PM. "Opportunity is still making her laborious way over to Cape Verde. This weekend we had a drive planned, but the wheels slipped too much in the loose sand that we're driving on, so just to be safe, the drive was cut short. The good news is that this week Opportunity will be driving every day, so we should make better time. More good news is that we got some pretty pictures down over the weekend. First and foremost, the full-res frames of the false color mosaic of Cape Verde finally came down. Check it out (click for full-res) ..."
By Keith Cowing on April 8, 2008 12:24 PM. "Sobering new NASA estimates that cancellation of the space shuttle in 2010 could cost up to 9,000 aerospace contractor jobs nationwide -- 6,400 of them here at KSC -- are refocusing Congressional pressure on the White House for additional funds to accelerate development of the Ares/Orion shuttle replacement vehicles." By Keith Cowing on April 8, 2008 9:07 AM. "There is no NASA without Marshall Space Flight Center, because there is no space travel without propulsion," [Sen. Richard ] Shelby said. Shelby met with NASA Administrator Dr. Mike Griffin last week to discuss Marshall's future, he said, and was pleased that Griffin assured him that propulsion work would continue in Huntsville." By Keith Cowing on April 7, 2008 12:25 PM. Reader note: "For those of us NASA folks who will never see this, this is really cool. I'm looking at these pictures from two views - technology and job loss." Continue reading External Tanks: Familiar Sights Soon To Disappear. By Keith Cowing on April 7, 2008 10:38 AM. "A relative handful of companies that benefited from collaborating with Glenn, or at least looking over the shoulders of its scientists and engineers, are bound to be disappointed. Most residents of Northeast Ohio won't feel a thing. That doesn't mean the Glenn Alliance for Technology Exchange was a bad idea. On the contrary, it was a great idea." "Likewise, the aerospace industry in Central Florida is much more than space exploration. It is about research and medical science; it is about quality of life; it is about a powerful and positive economic impact; it is about homeland security and space tourism. And, most important, it is about the future of the Central Florida region." By Keith Cowing on April 7, 2008 10:37 AM. "A union at NASA Glenn Research Center is worried about the number of workers who have been diagnosed with cancer, despite studies saying the rates are within normal range. Leaders of the Lewis Engineers and Scientists Association are asking several members of Congress to investigate the incidence of cancer. The disease has been diagnosed during the past three or four years in about 40 of the 100 workers on the Developmental Engineering Building's third floor, said Dennis Pehotsky, a spokesman for the association." By Keith Cowing on April 7, 2008 10:34 AM. Will the Ares and Orion projects replace all the jobs lost to the space shuttle phaseout? "We won't know the exact specifics to that until we get the actual contracts in place," Chapman said. Though other space manufacturing sites around the country have become accustomed to the inevitable shifts in work, this is the first time in more than three decades that there has been a change in civil space policy that affects the Michoud work force, said Sheila Cloud, the NASA administrator in charge of the transition at Michoud. "I think they are extremely nervous," she said of the Michoud employees. "This work force is different from many, if not most, (NASA) work forces. They are totally unfamiliar with the process, and that heightens their concerns. We talked to them about what to expect, to best of our abilities." Editor's note: Gee, Sheila, then instead of leaving them in the dark, how about clueing these people in, once and for all? By Keith Cowing on April 6, 2008 8:21 PM. "NASA is preparing to return its astronauts to the moon, in preparation for a future mission to Mars. Bob Simon reports. Sunday, April 6, at 7 p.m. ET/PT on 60 Minutes (video)"
"From the mountains of Utah to the factory floors of Cleveland, from the space center in Houston to the marshes of Virginia, spacesuits are being tested, rockets are being fired, and capsules are being designed. The United States is once again aiming to launch astronauts to the moon and yes, even, to Mars." By Keith Cowing on April 6, 2008 12:54 PM. "It is unsettling that with time running out before the grounding of the shuttles, so much uncertainty remains, both with the Constellation replacement program and NASA employment projections. This, in fact, may be rocket science, but it seems the agency is sorely in need of some good old-fashioned long-term management and planning expertise." By Keith Cowing on April 6, 2008 12:53 PM. "There aren't a lot of people who need a watch that can survive the airless void of space, but Richard Garriott happens to be one of them. He's headed for the International Space Station and some extra-vehicular activity (spacewalking). Garriott could have just chosen to wear the vacuum-rated Omega Speedmaster, or maybe a Fortis Cosmonaut, but instead he turned to one of my favorite watchmakers: Seiko." By Keith Cowing on April 6, 2008 12:52 PM. "Gov. Bill Richardson and the director of New Mexico's spaceport made the rounds in Washington this week, trying to secure federal help in the state's push toward space commercialization. There were no immediate business or funding agreements but the effort could produce long-term payoffs after Richardson secured expressions of support from NASA's top boss and a key congressional leader. Richardson and Spaceport America executive director Steve Landeene met Wednesday in Washington, D.C., with NASA's Administrator Michael Griffin." By Keith Cowing on April 4, 2008 5:12 PM. "NASA is looking at options that would place dampers either in parachute region (between the Orion and the Ares 1 first stage) or in the aft skirt of the Ares 1 first stage. These dampers would be tuned to dampen out (de-tune) problematical vibrations produced by the burning of propellant." Editor's note: Much of these issues are contained in a 10 March 2008 internal presentation "Thrust Oscillation Focus Team Checkpoint Report" by Garry Lyles with all pages marked "SBU" (Sensitive But Unclassified). I asked if this presentation (which has been circulating widely) will be posted by NASA. NASA's response was to say that they would post "those that we can" and that "we'll certainly clean up" some charts. The entire SBU presentation is online at NASASpaceflight.com in their for-fee section. 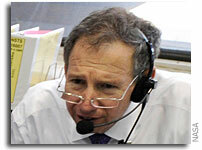 Editor's update: NASA has released an edited and shortened version of the Thrust Oscillation Focus Team Checkpoint Report by Garry Lyles (14 March 2008, 26 page) of the longer (10 March 2008, 66 page), SBU-labelled presentation. By Keith Cowing on April 4, 2008 1:37 PM. "The 2009 CJS spending bill is Senator Mikulski's third attempt to gain approval of her $1 billion NASA amendment. In 1987, Congress allocated $2.7 billion in the aftermath of the Challenger tragedy to pay for a replacement shuttle. In the aftermath of the Columbia tragedy, however, NASA was not given any additional funding to repair the remaining shuttles. The amendment will pay back the costs of returning the Shuttle to flight and restore cuts to science, aeronautics and exploration programs that were cut in order to pay for the return to flight." By Keith Cowing on April 4, 2008 12:53 PM. "The Government Accountability Office highlighted other potential problems, including too much weight in both the rocket and Orion capsule, design issues with a new engine for a booster, insufficient facilities for certain types of testing, and private industry's inability to make the Orion capsule's 1960s-style peel-away heat shield. None of the technical problems are "a fatal flaw," the report's author, Christine Chaplain told a House Science subcommittee Thursday." "But during a design review for Ares I in October 2007, engineers calculated that the rocket might vibrate so severely in the first few minutes of launch that it could actually destroy itself, threatening astronauts' lives. The problem was made public in January, after the independent website NASA Watch and the Associated Press questioned NASA and filed Freedom of Information Act requests with the agency." By Keith Cowing on April 3, 2008 10:35 PM. Editor's note: Today's hearing on NASA's exploration program was rather routine - and mundane. At least it stayed that way until Rep. Dana Rohrabacher (R-CA) asked a rather odd question. Rohrabacher, the former space subcommittee chair, asked the panel if they knew of any "antigravity research" being done at NASA. After an awkward pause they all said "no". Rohrabacher did not give a reason for asking this question and seemed satisfied with the answers he got. Of course, antigravity would be a nifty way to solve all of Ares 1's weight problems. Before you write this off as just a nutty question, I suspect that he asked this question just to get a pesky constituent off his back. You may think Rohrabacher is listening to a different drummer at times, but do recall that he was an early proponent of planetary defense from NEOs - and characterizing the potential threat they pose - something that has gone from fringe to mainstream - despite NASA's foot dragging. Then there was his constant pursuit of NASA on cost overruns, commercialization, technology transfer, and other things NASA has little inherent interest in pursuing. He also tried to teach Dan Goldin how to surf. Oh yes. He is also one of the prime reasons why this Democrat (me) gets to ask questions at NASA press events. So let's not write him off - just yet. By Keith Cowing on April 3, 2008 5:30 PM. "NASA is currently working toward preliminary design reviews for the Ares I and Orion vehicles. While this is a phase for discovery and risk reduction, there are considerable unknowns as to whether NASA's plans for these vehicles can be executed within schedule goals and what these efforts will ultimately cost. This is primarily because NASA is still in the process of defining many performance requirements. Such uncertainties could affect the mass, loads, and weight requirements for the vehicles. NASA is aiming to complete this process in 2008, but it will be challenged to do so given the level of knowledge that still needs to be attained. The challenges NASA is facing pose risks to the successful outcome of the projects." By Keith Cowing on April 3, 2008 3:04 PM. "As you probably know by now, I have announced my resignation as NASA's Associate Administrator for SMD and will be departing at the end of this week. Dr. Ed Weiler will assume this post on Monday April 7. I assure you that my decision to resign came only after several months of hard thought and reflection about the consequences of spiraling mission costs that SMD could not control. In the end, this became an important matter of principle that trumped even my boss, NASA Administrator Mike Griffin's desire for me to stay and my regard for him." By Keith Cowing on April 3, 2008 2:58 PM. "Thus, at a minimum, NASA needs to follow good program management practices and do its best to control costs, something the GAO witness will discuss. NASA also needs to do a better job of keeping Congress informed of its progress on critical initiatives, so we can determine if they are proceeding in the right way and on budget. In addition, it means that we need to make sure that NASA's Exploration program is structured in a way that ensures that the critical long-term exploration research and technology investments will be made." By Keith Cowing on April 3, 2008 1:35 PM. "No one from the school, neither students, nor the faculty, said a word contrary, or even questioned when Bruce Buckingham, NASA spokesman and news coordinator took a huge verbal swipe at presidential candidate Senator Barack Obama. Without warning, the talk had drifted into the political arena. It would drift back to center again when the 'no-no' topic "peace" reared its unpolitic head from this attendee. Lamenting the fact that candidates have "not made space a priority," Buckingham said Obama's proposed education plans were anti-NASA and should be rejected by Brevard voters. Buckingham cited earlier, unspecified reports that Obama's plans to bolster national education would be funded "out of the hide of NASA." "I'm not sure I like that," Buckingham continued. "I'm not sure the voters of Brevard County would appreciate that." Editor's note: I sense that there is possibly some less than accurate and out of context quoting going on here. I have asked KSC PAO for clarification. Editor's update: According to Allard Beutel at NASA KSC PAO: "We're trying to verify what was and wasn't said at this event, but at this point I honestly don't know. If what was blogged is accurate then obviously the views expressed by Mr. Buckingham are his own personal opinion and don't reflect an official position by NASA. As you know, the agency can't and doesn't do that. I expect to learn more, but that's all I have right now." By Keith Cowing on April 3, 2008 11:55 AM. "The agencywide cut amounted to about 1 percent of the NASA budget, while Langley's slice was less than 1 percent of its total. But NASA leaders are now putting an emphasis on speeding up procurement and spending, lest Congress decide to send more of its cash elsewhere." By Keith Cowing on April 3, 2008 11:54 AM. "The center has a very significant PROBLEM: our projected institutional support budget (determined by HQ) is inadequate to meet the current way do business. As we look forward, we now have an OPPORTUNITY: redefine the way we accomplish our business, for significantly less cost, and still meet our program and project needs, provide for the health and safety of our work force and comply with our regulatory and legal requirements." By Keith Cowing on April 3, 2008 11:42 AM. "NASA will host a media teleconference on Thursday, April 3, at 2:30 p.m. EDT to discuss findings from the Ares I thrust oscillation focus team. The team has been studying possible vibration concerns in the early designs of the new crew launch vehicle NASA is designing as part of the Constellation Program, which is building a spacecraft that will return humans to the moon by 2020." By Keith Cowing on April 3, 2008 11:37 AM. "The Jules Verne, the first European Space Agency Automated Transfer Vehicle, docked to the aft port of the International Space Station's Zvezda Service Module at 10:45 a.m. EDT Thursday. The unpiloted cargo spacecraft carries more than 7,500 pounds of equipment, supplies, water, fuel and gases for the station. It also carries hopes and aspirations of the European Space Agency. The ATV and its advanced rendezvous system could play an important role in future space exploration." By Keith Cowing on April 3, 2008 10:01 AM. "On Thursday, April 3, 2008 at 10:00 a.m., the House Committee on Science and Technology's Subcommittee on Space and Aeronautics will hold a hearing to review the status of the National Aeronautics and Space Administration's Exploration initiative and examine issues related to its implementation. Is NASA's strategy in designing the Orion CEV to first service the ISS and then upgrading it to enable lunar missions the most cost-effective approach? That is, is the upgrade approach, rather than designing a crewed vehicle capable of both missions at the onset, the most cost- effective approach? What would be the effect on the March 2015 Initial Operating Capability (IOC) date for Orion and Ares I if NASA is funded at the FY 08 level required by a Continuing Resolution in FY09? Would this reduced level for Constellation Systems exacerbate the "gap" and if so, by how much? Is it technically and programmatically possible to accelerate the Orion CEV's Initial Operating Capability (IOC) to a date earlier than March 2015 and still maintain a confidence level of 65%? Will the March 2015 CEV IOC date slip if projected Shuttle retirement transition costs starting in FY2011 exceed NASA's goal of less than $500 million? How close is NASA to resolving the Ares I thrust oscillation issue and will this issue have any impact on milestones leading up to the March 2015 IOC date?" By Keith Cowing on April 3, 2008 9:14 AM. "It's been clear for some time that Florida's Space Coast would lose a lot of good jobs when NASA retires the space shuttle. But that didn't take away the sting of this week's report from the space agency showing how bad the losses would be." Editor's note: Waiting until the last minute to act on this wasn't the smartest move on Florida's part - when options are limited. It's not like this has been a secret for the past 4 years and that there was any outcome other than massive job loss - no matter how small the gap between Shuttle and Orion was. By Keith Cowing on April 3, 2008 8:58 AM. "Another wonderful but challenging day in the mountains! In an effort to get our bodies acclimatized to the thinner air of Everest Base Camp and above, we left our camp in Dingboche this morning and ascended a rather steep ridgeline above the valley, peaking at 16,400 feet above sea level." By Keith Cowing on April 3, 2008 12:12 AM. "Col. Joseph W. Kittinger Jr., 2008 Lifetime Achievement Trophy"
On August 16, 1960 he made the final jump from the Excelsior III at 102,800 feet (31,330 m). Towing a small drogue chute for stabilization, he fell for 4 minutes and 36 seconds reaching a maximum speed of 614 mph (989 km/h) before opening his parachute at 18,000 feet (5,500 m). Continue reading Skydiving From The Edge Of Space. By Keith Cowing on April 3, 2008 12:00 AM. "Initial human missions to Mars will be a precious commodity wherein a maximum amount of information is gathered by each crew. As was the case during innumerable terrestrial missions of exploration, the Martian terrain that visiting crews must traverse in order to gain an understanding will often be difficult. This is accentuated by the fact that Mars is a world of geology - one whose surface area is equal to dry surface on Earth. Human crews will be called upon to use a variety of skills and tools to traverse the Martian surface - including those often associated with hiking, mountaineering and technical climbing. While rovers and other mechanical devices will be employed, it should be assumed that skills commonly associated with rock climbing, caving, and mountaineering on Earth will also be required." By Keith Cowing on April 2, 2008 10:34 AM. "Universal has acquired nonfiction novel "First Man: The Life of Neil A. Armstrong" and will turn it into a film about the first person to set foot on the moon, says Variety. NASA historian James R. Hansen got rare direct access to Armstrong, a test pilot-turned-astronaut who was so driven to reach the moon and play the role of American hero that he became known as "the Ice Commander." Reader note: "Holy smokes. Alan Shepard was the Ice Commander, not Neil Armstrong"
Reader note: "Re: the Armstong movie. At least a couple posters on that site caught the factual errors in the PR release for the movie, i.e., about the LM hatch and the "ice commander" tag. More Hollywood crapola." Reader note: "While its true that Shepard was known as the "Icy commander", some of Armstrong's fellow astronauts came to calling him the "ice commander" after Gemini 8, per "First Man" (page 436 in the softcover edition). That aside, there were some inaccuracies in the Variety article (on which the Coming Soon story was based), and those I understand were the result of Nicole Perlman (no relation) being misunderstood/misquoted. - Robert Pearlman"
By Keith Cowing on April 2, 2008 9:09 AM. "Similar poll numbers characterize popular approval of NASAs Constellation Program, which is designing and building the next generation of launch vehicles, Ares I and Ares V, as well as the spacecraft Orion and Altair to replace the space shuttle, return humans to the moon and travel to Mars and beyond." Editor's note: Funny how Scott Horowitz neglects to mention in the short bio at the end that he is currently being paid by both NASA and ATK to work on the Ares 1 rocket. So much for full disclosure. By Keith Cowing on April 2, 2008 12:00 AM. "2001: A Space Odyssey is a 1968 science fiction film directed by Stanley Kubrick, written by Kubrick and Arthur C. Clarke. The film deals with thematic elements of human evolution, technology, artificial intelligence, and extraterrestrial life, and is notable for its scientific realism, pioneering special effects, provocatively ambiguous and often surreal imagery, sound in place of traditional narrative techniques, and a very minimal use of dialogue. ... The film's world premiere was on April 2, 1968, at the Uptown Theater in Washington, D.C."
Editor's note: Have another look at the film's opening (below). Please play this as loud as you possibly can. Continue reading Our Past Future - 40 Years Ago Today. By Keith Cowing on April 1, 2008 8:59 PM. By Keith Cowing on April 1, 2008 5:30 PM. "Background: NASA's workforce surveys have indicated that communication is the key to managing the workforce during transition. NASA and its prime contractors are engaged in a robust communications effort at all levels to ensure that the workforce is kept informed of current programs and future plans. The Agency is utilizing many tools and media options to make this possible, and the effectiveness of these tools is continually evaluated in both surveys and by monitoring various media metrics." "In today's "Workforce Transition Strategy Initial Report," NASA estimated that there will be at least 6,400 jobs eliminated between FY 08 and FY 2011 at Kennedy Space Center alone. Of those 6,400 layoffs, NASA forecasted that 4,800 will come all in one year - 2011. These numbers could grow if problems arise with the Constellation program due to technological or funding issues." "GRIFFIN ... It provides an orderly transition of the space shuttle workforce. We estimate that we can use about 85 percent of the facilities that are in play today for the space shuttle." By Keith Cowing on April 1, 2008 12:54 PM. "Stephen Colbert asks Mars Rover expert Steve Squyres to explain gravity." Continue reading Todays' Video: Steve Squyres Demonstrates Comedic Prowess on Colbert Report. By Keith Cowing on April 1, 2008 10:43 AM. "The Virgle 100 Year Plan's milestones will include Virgle Pioneer selection (2008-2010), the first manned journey to Mars (2016), a Virgle Inc. initial public offering to capitalize on the first manned journey to Mars (2016), the founding of the first permanent Martian municipality, Virgle City (2050), and the achievement of a truly self-sustaining Martian civilization with a population exceeding 100,000 (2108). "Virgle is the ultimate application of a principle we've always believed at Google: that you can do well by doing good," said Google co-founder Larry Page, who plans to share leadership of the new Martian civilization with Branson and Google co-founder Sergey Brin." Editor's note: Yes, I know, it is April Fool's day - but this is fun ... so why not play along! By Keith Cowing on April 1, 2008 10:08 AM. "I just got a satellite phone call from Scott in Nepal. He and his team are currently in Tengboche (altitude: 3,867m - 12,687ft) where it is now evening. They have been resting in Tengboche while their bodies acclimate to the altitude. Tomorrow morning (2 April) they will depart for Dingboche (alt: 4,530 m - 14,800 ft). Once there they will rest again to continue their process of acclimatization to ever increasing altitude." By Keith Cowing on April 1, 2008 12:23 AM. "NASA stresses that its strategy is to "go as we can afford to pay," with the pace of the program set, in part, by the available funding. In 2004, the President proposed adding a total of $1 billion to NASA's budget for FY2005 through FY2009 to help pay for the Vision, but subsequent Administration budgets more than eliminated this proposed increase, and actual appropriations by Congress have been even less. Most funding for the Vision is thus being redirected from other NASA activities. To free up funding for Orion and Ares I, the space shuttle program will be terminated in 2010, and U.S. use of the ISS will end by 2017. NASA has not provided a cost estimate for the Vision as a whole. Its 2005 implementation plan estimates that returning astronauts to the Moon will cost $104 billion, not including the cost of robotic precursor missions, and that using Orion to service the ISS will cost an additional $20 billion. A report by the Government Accountability Office gives a total cost for the Vision of $230 billion over two decades." By Keith Cowing on April 1, 2008 12:05 AM. "In the bleakest employment forecast for Kennedy Space Center yet, a NASA report due out on Tuesday estimates that as many as 6,400 contractors could lose their jobs at KSC by 2011 right after the space shuttle is retired. With no rockets to launch, the KSC workforce, whose primary mission is to prepare NASA spacecraft for liftoff, is expected to go from 8,000 contract jobs today to between 1,600 and 2,300 in 2011." "NASA will hold a teleconference at 2 p.m. EDT, Tuesday, April 1, to discuss a report to Congress on the agency's workforce strategy while transitioning from the Space Shuttle Program to the Constellation Program. - Rick Gilbrech, associate administrator, Exploration Systems Mission Directorate, NASA Headquarters"